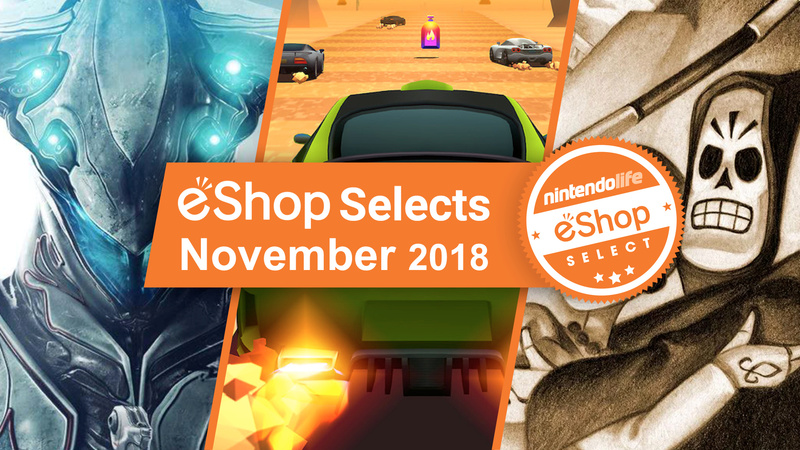 November's best Switch eShop games! With November now well and truly behind us, it's time to look back at the wonderful selection of digital delights that graced the Switch over the last 30 days. Once again, Team Nintendo Life has been passionately squabbling amongst ourselves to vote for our eShop games of the month, all in an effort to bring you a definitive list of the best games on offer. So, let's get started! Here are the best Switch eShop games of November 2018! 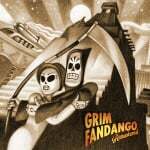 Taking third place this month is Grim Fandango Remastered, a now 20-year-old gem that we still love now just as much as we did way back then. There's a whole lot to enjoy here from its adventure and brilliant voice performances to the ability to travel back in time by playing the whole thing in its original 4:3 aspect ratio; we said that it's "still as enchanting and evocative as it was the first time you popped open that oversized cardboard box back on PC in 1998" in our review, awarding it a 9/10. Go on, what are you waiting for? In second place we have Warframe - a game so ambitious, successful, and popular that it almost feels wrong including it on this list. Technically, this is a digital-only release, however, and Panic Button's usual technical excellence mixed with the game's already-existing co-op shooter goodness made it all too easy to rack up votes among the NL team. 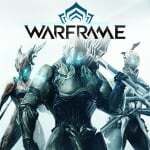 We awarded the game an 8/10 in our review, saying that "from the impressive visual fidelity Panic Button has maintained, to the sheer breadth of content you can access for free, Warframe represents another milestone for the console". The one you've all be waiting for, though, speeding into first-place glory this month, is Horizon Chase Turbo. Scratching that itch for a modern day take on Sega's classic Out Run beautifully, we felt that the game ticks all the boxes that define the best examples of arcade racers. If you're looking for something to fit that bill on your Switch, you won't find much better than this one; we described it as an "absolute must-have for anyone even remotely interested in the genre" in our review, awarding the game a mighty 9/10. Too many great games. How am I supposed to play them all? There are only 24 hours in a day. I've already downloaded Warframe and am very interested in Horizon Chase Turbo, but what I'm most excited about, honestly, is R-Type Dimensions. I'm so happy to have this game. Lots of good games on that list, though. I loved Forgotten Anne. Will def give Grim a go as I never played the original! If you only buy one, make it Forgotten Anne. Generally I scoff at the idea of videogames as 'art'. This is one of those rare occasions it could be argued. Horizon Chase is put run re imagined, had a feel of Daytona on the Saturn and even the original Ridge Racer. So close to a 10 out of 10 game! That's a lot of great games for one month. Luckily I've already played some of them, like Grim Fandango and Machinarium. And Brawlhalla and the obvious standout Warframe are free to play. The demo of Forgotten Anne was good, but kind of a let down in a way, after the expectations I had from the trailer. I've been rewatching a lot of Ghibli movies lately, so that may have something to do with it, it's added to my wishlist for later, maybe. Something that took me completely by surprise and I'm really on the fence about, is Spintires Mud Runner. I have zero interest in cars or trucks, but I love (!) games in which moving around and solving realistic physics puzzles are the challenge (like Snake Pass and Human Fall Flat), and/or where the world is just a beautiful sandbox. Probably Forgotten Anne for me too. Forgotton Anne. Liked the demo. Would love to have the game physically. Warframe, Mother Russia Bleeds and Rival Megagun. Great Games to play with my friends! I was busy with Pokémon so I only managed to download ABZÛ towards the end. Grim Fandango and Transistor are on my list though! It's almost as if Horizon Chase Turbo was built for the platform. I have it on mobile & steam, now switch too (which is fast becoming my gaming platform of preference). I will say this however; I do not get the OutRun feels from HCT, more the Lotus Esprit Turbo Challenge II feels. I did pick up R-Type Dimensions DX and (in true fashion) could not get the first stage tune from R-Type out of my head all day. Probably for the amount of time I spent listening to it trying to best that first level all those years ago. Horizon Chase Turbo is great. Highly recommended. It's blowing my mind a little that WoFF Maxima is being so underrated. In some ways it's a good problem to have. However I am out a lot of games being released now simply because I have a lot I am already working on, plus Smash coming out. To many games, not enough time. I live for games like R-Type. Something about destroying everything that moves in sight makes me relaxed enough to tolerate my job. I'm curious about Horizon Chase Turbo, even though other than Mario Kart I haven't had any interest in the racing genre since the mighty Sega Rally on Saturn. I voted for Full Metal Furies, but I wish I went for Machinarium instead. That game is far too good to be sitting at 0%. Speaking of Machinarium, developer Amanita Design released their latest game on iOS and Android this week, and it’s a masterclass in art direction, animation and playful design. It’s called Chuchel, please give it a look. @OldMcGroin But it's still a great game. Especially on the couch with friends and family. Horizon chase has been freezing on me. Maybe it's just my Switch, but about 4 times in the past day I've had to hit the home button and close the game, then restart it in order to play. It is happening after finishing a race, sometimes while it's saving, sometimes right after saving. It has not damaged my save game luckily. I love the game though. It is kind of like getting Outrun 2006 from PS2 and Xbox, which is a similarly amazing and fun arcade racer with great gameplay, music, and dynamic visuals running at 60 fps. Unfortunately I've nobody to couch co-op with so I'm dependent on online which is pretty disappointing on the Switch for anything not created by Nintendo. Capcom Beat 'em Up Bundle was another crushing blow. Always great to see one of Double Fine’s games break the top 3, which is made even better by the fact that it is a remaster of one of the studio’s classics. 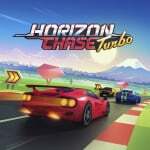 Horizon Chase hands down! Great little racer and perfect for the arcade and portable fan!! A more then suitable option to the absence of Outrun, even though the king of arcade racers is coming soon as well!! I really appreciate this list, but I don’t recall NL ever doing this in previous months. ...If other articles of this type do exist for previous months, please link them at the start of the article. This is helpful stuff to read. It's the only game doing this on my Switch, so I'm thinking it might be the software. Horizon Chase keeps on freezing. I deleted it and redownloaded the game, but it keeps freezing every few races, sometimes while trying to load a race. I know this isn't a software q and a message board, but just wanted to mention the problems I've had while otherwise really enjoying theis awesome game. All the praises to Horizon Chase are making me lose the will to wait for a sale to finally get it. On a side note, I do believe 99Vidas should be among the Honourable Mentions, it`s quite a good brawler. Warframe has pretty swiftly ruined everything else for me. Everything. Else. I'm still playing diablo, sooo that. It's still odd to me that people insist on linking Horizon Chase to OutRun when it's obviously a tribute to Top Gear and the Lotus series. Not saying there weren't good games this month. But nothing of paticular interest to me this month - in terms of eshop games. I've been playing Pokemon, Civ 6, and Stardew Valley (again). My vote goes to Warframe for sure. Gawd, is that a good game. Transistor really disappointed me though. World of Final Fantasy has been criminally ignored since it was announced, and even neglected by Square Enix. But as much as I advocated for the game, even I have to admit it wasn’t my pick for best eShop game of the month. Transistor, Horizon Chase Turbo, Valiant Hearts, Warframe... all incredible, incredible games. This was a banger of a month for quality eShop titles. Even Forgotton Anne was pretty good, Battlezone is great (played in VR), and R Type Dimensions is a classic. Ok, but will you guys cover Pianista: The Legendary Virtuoso? Forgotton Anne was an excellent (and beautiful) story-based game! My personal favorite of the month. Horizon Chase Turbo is very fun although I just started it, and so is Cattails. Horizon Chase Turbo has been an absolute blast so far. If you're not tempted at full price, definitely stick it on your watchlist for when it inevitably goes on sale as it's a really fun racing game and you won't regret the purchase! @Hikaru Yep, I agree. It 100% plays and feels like a Top Gear game. Almost all indie games. Basically to play AAA games i need a ps4 and for indie games a switch. It’s fine, no problem but why switch try to say they can compete in terms of games with ps4? Switch should have been only a handheld device, I never going to play indie games on tv. Well I see I’m in the minority with Ms’ Splosion-Man and Valiant Hearts. Both are great games, and the latter really hit me in the feels.